On April 16 the City Council will take action on an ordinance amending the Planning Commission review authority. While relatively benign in its title, the ordinance fundamentally changes the review and decision-making procedures for development applications. This proposed ordinance makes the Planning Commission the final decision maker on most major development applications, as opposed to City Council. While the intent of the ordinance may make sense, the procedure for making the change is flawed. The City Council does not have the authority to make this change. 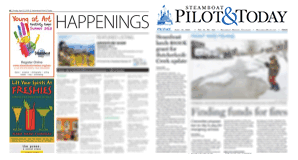 The Steamboat Springs Home Rule Charter created a Planning Commission “as an advisory agency to assist the City Council in providing for the development of the City of Steamboat Springs and its metropolitan area.” The charter is very clear in its intent with respect to the role of the Planning Commission as advisory and not as a decision maker. The Charter also states that “The City Planning Commission may also serve as the zoning commission of the City and shall perform such other duties as the Council may prescribe.” While this particular provision might be interpreted as giving the City Council the authority to change the Planning Commission’s role to make final decisions, such an interpretation would be flawed. There is a fundamental difference between assigning additional duties to the Planning Commission, as the charter states, and changing the established role of the Planning Commission from an advisory agency to a final decision maker. If the City Council desires to change the role of the Planning Commission, I believe the City Council must first amend the Home Rule Charter, and all charter amendments must be submitted to a vote of the electors. Please do not view these comments as being obstructionist, as I agree with the intent of the ordinance to place greater decision-making authority with the Planning Commission. It is the procedure for making this change that is flawed and the disregard for the language in the City’s Charter that is concerning. There have been recent decisions by City Council that have been questioned by community members because some feel the city is not following the established rules and policies and approving this ordinance could be construed as another example of this conduct. I urge council to consider the language and intent of the city’s charter and consider following the proper procedure for making this change to the Planning Commission’s role.